This was a miraculous winter wedding day in February in Toronto. The weather report had said the temperature was going to be up to +4 that day which meant no snow was going to fall. We woke up in the morning to find snow all over the ground and though we weren't supposed to start photographing until noon we rushed over at 9:00 in the morning to get a few photos with snow on the ground so their photos could have a winter feel to them. Well the snow melted away and the bride and groom got into their tux and gown and on we went. As we were standing by the door to go outside for pictures the snow started falling again in big fluffy flakes! Not only was it above freezing at the time and snowing but they were perfect flakes. So we ran outside and took pictures for about 20 minutes, then it stopped. That was the last of the snow for the day but when you looking through their wedding photos it looked like a winter wonderland. I haven't seen anything like that happen since and it was utterly amazing. We were so blessed to have such a thing happen. 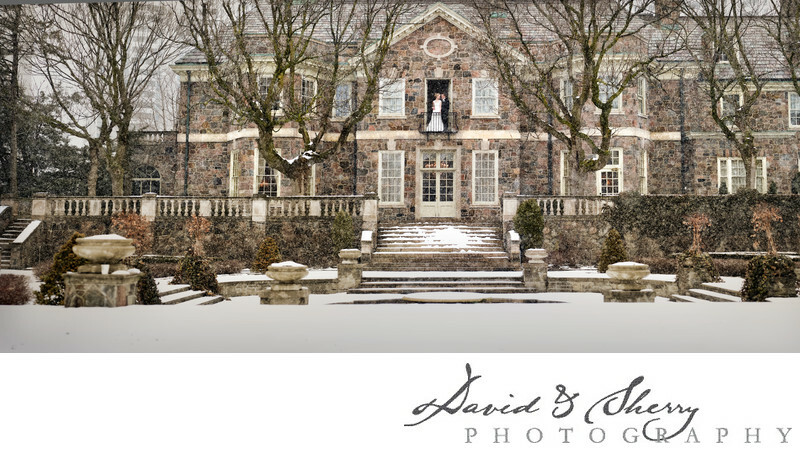 Graydon Hall Manor is a beautiful venue in the summer or in the winter and such was the case for the elegant wedding of Tom & Kate who took the luxury venue of Graydon Hall and turned it into their winter wonderland. Touches of snow, warm feelings and a room full of their closest family and friends. During their wedding we created some of the photos that became our favourite that we had ever taken. Partly due to the gorgeous newlyweds, partly from the snow and partly because the day worked out perfectly.